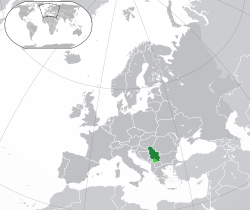 The Republic of Serbia (Serbian: Република Србија / Repbulika Srbija) is a country in Southeastern Europe. The capital city is Belgrade. To the north of Serbia is the country Hungary. To the east of Serbia are the countries Bulgaria and Romania. To the south of Serbia are countries Macedonia and Albania. To the west of Serbia are the countries Montenegro (the country that was once united with Serbia), Bosnia and Herzegovina and Croatia. Kopaonik national park, during winter. ↑ "Official Results of Serbian Census 2003 – Population" (in Serbian). p. 13. http://webrzs.stat.gov.rs/axd/Zip/VJN3.pdf. ↑ Census.gov (2013). "Country Rank. Countries and Areas Ranked by Population: 2013". U.S. Department of Commerce. Archived from the original on 2013-05-09. http://www.webcitation.org/6GUHbJYCI. Retrieved 2013-05-09. ↑ 3.0 3.1 3.2 "IMF World Economic Outlook Database, September 2011". International Monetary Fund. 2011. http://www.imf.org/external/pubs/ft/weo/2011/02/weodata/weorept.aspx?sy=2010&ey=2016&scsm=1&ssd=1&sort=country&ds=.&br=1&c=942&s=NGDPD%2CNGDPDPC%2CPPPGDP%2CPPPPC%2CNID_NGDP%2CNGSD_NGDP%2CTXGO%2CTMGO%2CLUR%2CLP&grp=0&a=&pr.x=62&pr.y=15. Retrieved 21 September 2011. ↑ "Dragin obrazlozio predloge zakona u oblasti poljoprivrede". Vlada Srbije. 2005. http://www.balkans.com/sr/open-news.php?uniquenumber=53766. ↑ "U Srbiji do 2010. godine 10% teritorije nacionalni parkovi". Poslovni Magazin – Business Surfer. http://www.poslovnimagazin.biz/magazin/privreda/u-srbiji-do-2010-godine-10-teritorije-nacionalni-parkovi-30-377. Retrieved 28 April 2010. ↑ "Upper-middle-income economies". The World Bank. http://web.worldbank.org/WBSITE/EXTERNAL/DATASTATISTICS/0,,contentMDK:20421402~pagePK:64133150~piPK:64133175~theSitePK:239419,00.html#Upper_middle_income. ↑ Borka Tomic (13 April 2006). "Rebranding Serbia". Invest in Serbia. http://www.invest-in-serbia.com/modules.php?name=Content&pa=showpage&pid=66. ↑ "Projekat Rastko: Istorija srpske kulture". Rastko.rs. http://www.rastko.rs/isk/isk_17.html. Retrieved 24 May 2012. ↑ "Stevan Stojanović Mokranjac (1856—1914)". Riznicasrpska.net. 28 September 1914. http://www.riznicasrpska.net/muzika/index.php?topic=60.0. Retrieved 24 May 2012. This page was last changed on 12 December 2014, at 17:05.